Objective: To increase doctoral enrollments as part of the university’s goal to increase both graduate and professional student enrollment. Mechanism: The Voluntary Tuition Incentive Program for Research Grants will provide resources to support new doctoral graduate research assistantships through the return of revenue to funded investigators and their departments. 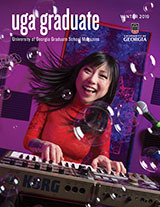 For each graduate assistant (GRA) who receives full time, in-state graduate tuition from a sponsored programs administered research grant or external contract (RIAS code), 1.5 times the university’s base tuition rate will be returned to the department of the principal investigator to cover an assistantship for another doctoral student (DPAS code, 970 account). There is no limit on the number of RIAS returns per research grant/ contract. These funds must be deployed within one year of receipt. Departments must use these assistantships strategically to achieve the goal of the program: to increase the number of enrolled doctoral students. Mechanism: The Voluntary Tuition Incentive Program for Training Grants will provide resources to support new doctoral graduate research assistantships through the return of revenue to funded investigators and their departments. For up to two graduate research fellows (GRTRN) who receive full time, in-state graduate tuition from a sponsored programs administered training grant (RIAT code), 1.5 times the university’s base tuition rate will be returned to the department of the principal investigator to cover an assistantship for a second doctoral student (DPAS code, 970 account). The maximum is 2 returns per training grant. These funds must be deployed within one year of receipt. Departments must use these assistantships strategically to achieve the goal of the program: to increase the number of enrolled doctoral students.